Providing the Buffalo area with professional, fast and eco-friendly junk removal services. 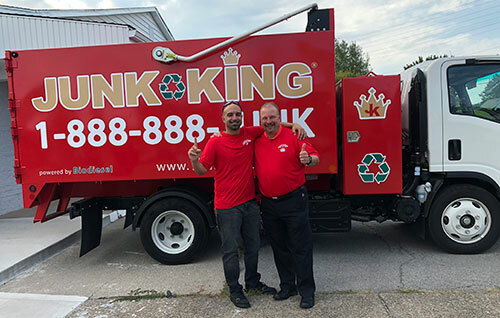 Dale Wittlief, owner of Junk King Buffalo, and Frank Garcia, director of operations, provide junk removal and hauling services to the residents of Buffalo, including Niagara Falls, Lockport, and Dunkirk areas. As lifelong friends and mentors, both Dale and Frank enjoy spending time together along with their families – one of their favorite pass times is cheering on their local Buffalo Bills football team. Prior to owning a junk hauling company they both held separate careers, but both were interested in running a locally owned business. Junk King was the perfect fit combining their skills of business development, operations, and customer service. Sharing a passion for people, and their community, both Dale and Frank are consistently seeking local non-profit organizations, networking groups, and realtor associations as well as local residents of the area to provide the most affordable, efficient, and reliable junk removal service. In addition to getting involved in their local community, Dale and Frank expect to be very successful by doing their part to go green! Junk King’s team of hauling professionals take away all of your items, and sorts through them at our local facility right here in Buffalo. Through this sorting process, they are able to determine what items can be recycled, donated, and/or re-purposed. You don’t have to worry about sorting items ahead of time, because Junk King does all the work These practices play a vital role in Junk King Buffalo’s commitment to providing local residents and businesses with the greenest solution to junk removal. If you need decluttering, reorganizing, remodeling, or moving – you have come to the right place. These are just a few of the junk removal services we are happy to provide. From furniture hauling and yard waste removal, to attic clean outs and e-waste disposal Buffalo’s team of hauling professionals are happy to get the job done. When you book your appointment our team will call when they are on the way to your location. We will arrive with our Big Red trucks, and 2-3 hauling pros to get the job done efficiently. Junk King™ provides reliable junk pickup service in the Buffalo area. Our staff can take care of the junk hauling for you! Schedule your next junk removal pick-up by booking online above or by calling 1.888.888.JUNK (5865). April 18, 2019 by J.G. I have never been so happy with an outside service. They were GREAT, took all my just, asked questions first, did not scratch or dent a wall and swept up when all was done. Pricing was extremely far. Would recommend these local guys and girl to anyone in the Buffalo area. April 11, 2019 by B.S. On time. Pleasant to talk with. Compromised. Easy payment options. Thanks. April 01, 2019 by J.L. The speed and affordability was amazing, thanks Junk Kings! March 26, 2019 by M.L. everyone was very friendly. service was quick.